1) Be sure to connect the cone nut end of the hose to the hand shower head and hex nut end to the T valve. 2) Don't connect too tight or loose. 3) Turn off the 3- way tee diverter after each use. 1) Only compatible with 7/8" toilet, not compatible with 1/2" or 3/8" or the other size tank/toilet. 2) Suitable for the US and Canada family only, not universal for Europe or other countries/area. High-pressure hose: Double-layer structure, high-pressure explosion-proof hose, the prismatic side of the hose is connected to T-adapter, another side is connected to sprayer head. Quick and easy installation: Do not need to be technically installation, following the instruction will need only few minutes. Mutiple function: Use as bidet attachment, to cloth diaper sprayer, clean sink, toilet or bathroom. 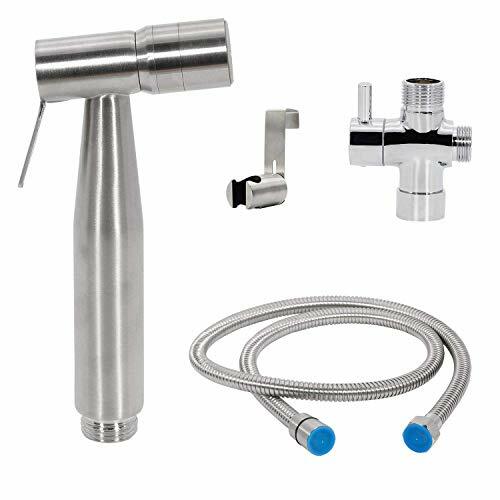 Includes: Sprayer Heads, T Valve Adapter, 59 Inch Hose, Wall Mount/Hook Holder and nails for completed set. Please check after received your order. If you have any questions about this product by CLEESINK, contact us by completing and submitting the form below. If you are looking for a specif part number, please include it with your message.